Santa must have read my pen wish list because I had one of these Aurora Optima pens under my tree! After the initial shock, I picked my jaw up off the floor and headed to my desk for a bottle of ink. 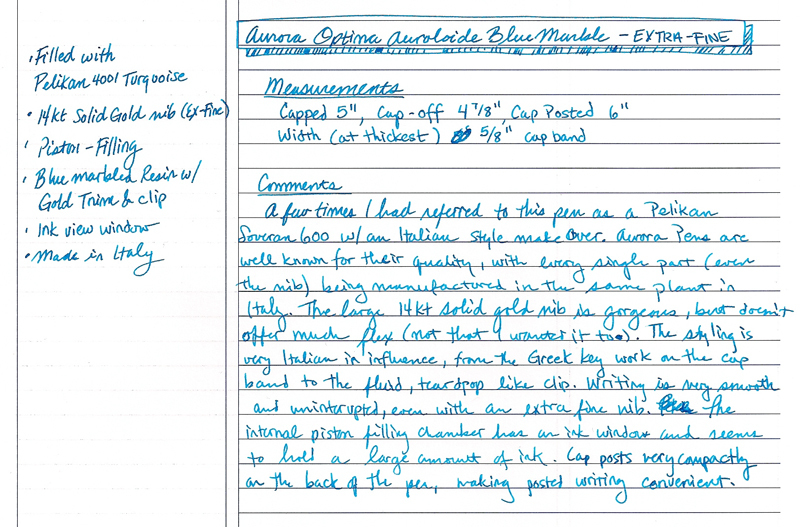 The main draw that led me to this beauty of a writing instrument is the blue & gold design. The Marbled blue resin, combined with the solid gold trim reminds me of when I went to Capri with the sparkling blue waters matched against the warm sun. What really sealed the deal was the piston-filling mechanism and the size. 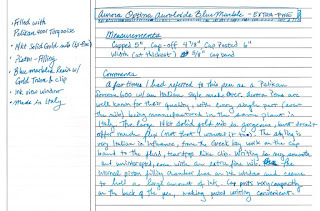 As I scribble in the handwritten sample, I've often referred to the Optima Auroloide as the more stylish, Italian version of the Pelikan Souveran 600 fountain pen. They both fill by internal piston-filling system, have solid gold nibs and are similar in dimension with the cap posted. The Optima Auroloide has much more classical style and flair than the German-made Souveran, in my humble opinion. So, with coffee on my desk and a fully loaded Optima (with Pelikan 4001 Turquoise ink) I gave the pen a whirl, writing on my Rhodia Circa paper. The extra-fine offers a solid line, not being too dry or too thick. The line thinness is equivalent to a Pelikan m200 in fine point. There isn't that much flexibility in the gold nib, but it does write smoothly with a bit of springiness. One of the huge positives that I really enjoyed was how the cap posts on the back end while writing. The size is compact (only 6" when posted) and the weight is light enough to write cap-posted in a comfortable fashion. The piston-filling reservoir seems to hold a ton of ink. There is a window (pictured above) that is located right before the screw threads on the black front section to show the ink level when it gets down to the very end of the fill. I will have more to report once the ink runs out on the DPF (Days Per Fill - trying to coin a new pen term here). From my "guesstimation" I would reckon to say it takes in as much as a Pelikan. The Aurora Optima Auroloide is definitely one of the best Christmas presents I've ever received. Looking forward to using this pen for a long time to come and I will end up revisiting this review a few months from now to add my opinions after a longer period of usage.